Venturia inaequalis (sexual stage) and Spilocaea pomi (asexual stage) fungi infect leaves, shoots and fruits. 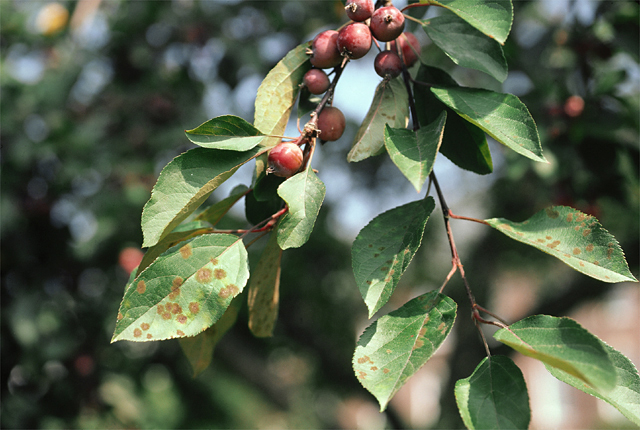 Apple scab infects apple and crabapple (Malus), several species of mountain ash (Sorbus), firethorn Pyracantha), several cotoneaster species as well as common pear (Pyrus). Leaves, flowers, fruit, and green twigs are susceptible to infection. The first symptoms on leaves are water soaked lesions that turn olive green to dark gray and develop a velvety appearance. In due course, infected leaves turn yellow and drop from the tree prematurely. Spores produced in the lesions continue to infect young growth whenever wet periods occur as the season progresses. 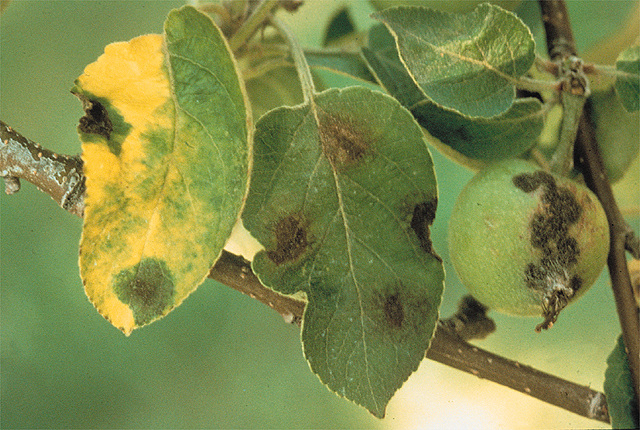 Apple scab often defoliates severely infected trees by mid to late August. The fungus survives the dormant season in the infected leaves and twigs. Black fruiting structures develop in leaves from the previous season during late winter and early spring. Release of spores occurs during wet periods in the spring and they infect young leaves, shoots, and fruit. One to three weeks after infection velvet-like, dark-green fruiting structures and spores. The conidia infect new growth if conditions are wet for about six hours and the air temperature is mild. Repeating episodes of spore release and infection occur throughout the growing season. Moist spring and early summer weather accompanied by cool temperatures favors this disease. Remove and dispose of infected leaves near the tree during and after the growing season. This will reduce but not eliminate inoculum available for infection. Prune rapidly growing water sprouts emerging from branches, since many of these water sprouts have apple scab lesions on them. In addition, prune to increase air circulation and sunlight penetration into the canopy, which promotes drying of foliage. To minimize disease problems the best time to prune is in late winter or very early spring before new growth starts. Otherwise, prune when the bark and weather conditions are dry. Consider growing varieties or species of apple, crabapple, and mountain ash that are resistant to apple scab. Apply fungicides as buds break open and when petals fall. Make two or more additional applications at 7-10 day intervals if wet conditions prevail in the spring. Photos: A. L. Jones and E. M. Dutky, Diseases of Woody Ornamentals and Trees. APS Press.